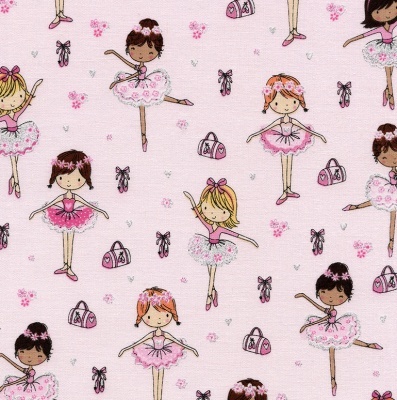 Cute ballet dancers on a pale pink background with silver glitter detail, 100% cotton from the Timeless Treasures Little Ballerina Your Majesty cotton collection. 112cm / 44" Width, this fabric weighs approximately 150gsm. excellent material. pretty pink background with very sweet ballerinas in toning colours.The silver thread around the tutu enchances the fabric.